Peppermint Puff's Blog: My Boyfriend Started A Music Blog! My Boyfriend Started A Music Blog! My other half has just started a music blog. I'd love if you could check it out / follow! I'm proud of him for starting / pursuing it because I know he's a busy lad. I even managed to convince him to post about Kyary Pamyu Pamyu because I know he loves her really! The blog is called repeat all and features lots of unique and indie music! 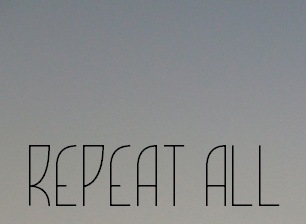 "Repeat All is a Cambridge, UK Indie music blog that started out in October 2012 with the sole intention to bring you all the best tunes that make you want to dance around the room doing the bendy knees dance!" If you like it then you should put a comment on it! Treasure Tuesday 5: Honey Bunny!